Well I'm going to just up and admit it. I'm in love with soft bulky yarn and giant crochet hooks. I just love how fast you can whip out a project in no time flat, and the finished results have been turning out so cute. First it was the soft and fluffy 2-hour bulky scarf (which makes for fabulous gifts) and now I have gone and found the most adorable (and incredibly trendy) slouchy hat - with a free pattern to boot! 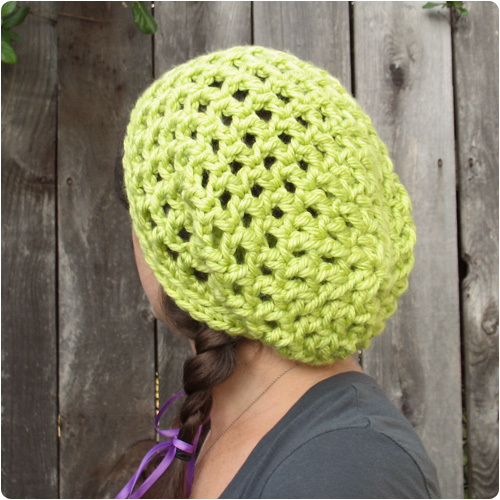 I have to thank one Ms. Julie King over at her Gleeful Things blog for not only giving out this free crochet pattern to her readers, but making it look so easy to make and fun to wear. I think my favorite part of this hat is that she has formulated the pattern to use exactly one skein of Lion Brand Hometown USA yarn (about 80 yards). This is wonderful because it comes in a ton of beautiful colors and they can easily be found in most Walmart stores for around $3.50 a skein. I love when companies get creative with the yarn names. Each color (I believe there are 50 of them available) is named after a city in America. Colors such as Portland Wine, Seattle Denim, Cleveland Brown, Las Vegas Gold, and Honolulu Pink, to name a few. Celebrities, musicians, teen reality shows, college towns, Gap ads, it seems every where I look people are sporting the slouch. 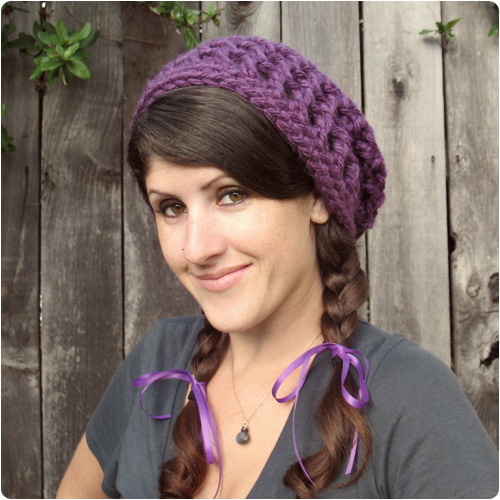 I've seen slouchy hats for sale in stores and in trendy online stores for as much as $49 a pop. Ouch. Or you can just take a little extra time and make your own with a big "N" crochet hook and one skein of your favorite color of yarn. The easiest way to get this free pattern is to go to her site here where she has step by step instructions. I went through the steps myself and took pictures of the play by play process, so feel free to follow along if you are new to crochet. Okay, so first you will need 1 skein of the Lion Brand Hometown USA yarn. I picked a creamy neutral color for my first attempt, it was called "Los Angeles Tan" The first part of the directions say chain 4. This counts as the first DC plus a Ch 1 stitch. Then you will DC in the 4th chain from the hook and chain one. Do this 6 more times until you have a ring of 8 DC with a chain between each. She has a play by play explanation in pictures if you need it here for the beginning steps. Join each round together when you are finished. Look carefully above. Round 1 has 8 DC stitches (with ch 1's in between) and Round 2 has a total of 16 DC stitches (with ch 1's in between). If you want to check gauge here, Julie says rounds one and two should measure 5 inches across. Mine was a little less but pretty close. Round 3 I think was the most confusing round for me at first. I decided to scan through all of the reader comments and a few other people had trouble with the wording of the pattern but if you have ever watched the crochet geek on you tube (aka Teresa) it is a simple increase row, of every other one. If you were to double every DC like you did in round two, you would go from 16 stitches around to 32. For round three you only want to end up with 24 stitches around, which means that one time you will do 1 DC and a ch 1 in the next stitch, and the next time will be 2 DC with chain 1's in between in the following stitch. Every other time you will either do 1DC and the next time 2 DC. This way you will end up with 24 stitches around. Here's what it looks like. Round three increases 1 DC then 2 DC every other stitch for a total of 24. If you make it through round 3 then you are done with increases, and the rest of the hat is a piece of cake! After that rows 4-11 are going to be exactly the same. You are just going to put 1 DC (+ a Ch 1 stitch) for each stitch around. Here's what it looks like after round 4, it will start to slightly curve up like a bowl. Be sure to count off, or check off each row as you go. Here is what it will look like after a few more rows. Here is a shot of what it is starting to look like from the side view. That Ch 1 space between all the DC stitches you've been doing is what gives this a "waffle" look. Waffle cone hat after 7 completed rounds. By the way, I wanted to point out how to join the last stitch to the first stitch. Remember each new round you start will begin with a chain 4. This counts as a DC and a chain one. It will pull very flat along your work so when you come back around it's almost hard to find it. See the pink numbers below? That is your starting Ch 4. The blue arrow is pointing at your last stitch of the round and now you need to slip stitch them together. Count up and put your hook through the Ch 3 spot to make your joining slip stitch. You leave the 4th chain alone because it acts as the Ch 1 space between each DC around. When you join the last stitch of the round with the first chain, it will pull the stitch up straight and make it look like the other stitches in the round with the correct space between each one. Connect your slip stitch to join the round in the Ch 3 space. Just a few more rounds to go now. I am almost ready to finish the hat! The last two rounds are very easy. After round 11 is completed you are going to simply do a nice SC around every stitch you've made for a total of 48 stitches. This gives the hat a nice finished edge. But I love the very last row, because it really makes the edge pop. You are still going to SC around for round 13, only you are going to do that in the back loop only (BLO). When you do this it give the final row some dimension that I think looks really nice. Back loops only give the edge a wonderful finished look. After that you just want to finish it off and tie up the loose ends. 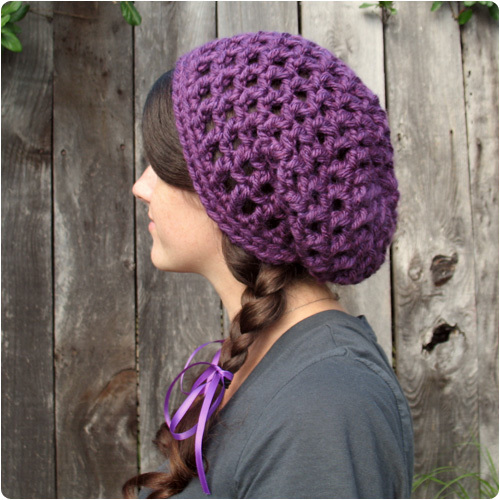 By just looking at this hat it doesn't look like it's going to become a slouchy hat. It almost looks like an elongated bowl of sorts. The real slouchy "art" comes from how you put the hat on. You want to put it on more like where you would place a headband, and let the back part of the hat flop down behind you. Like this. Cute low side ponies and some bangs peeking out really help make this look fashionable! Julie models her own hat. I love the purple color and the matching ribbons. (Picture used with permission). That second yellow hat I made was in a color called "Pittsburgh Yellow" because I asked the teen's mom what was her favorite color, so I tailored the hat to her tastes. 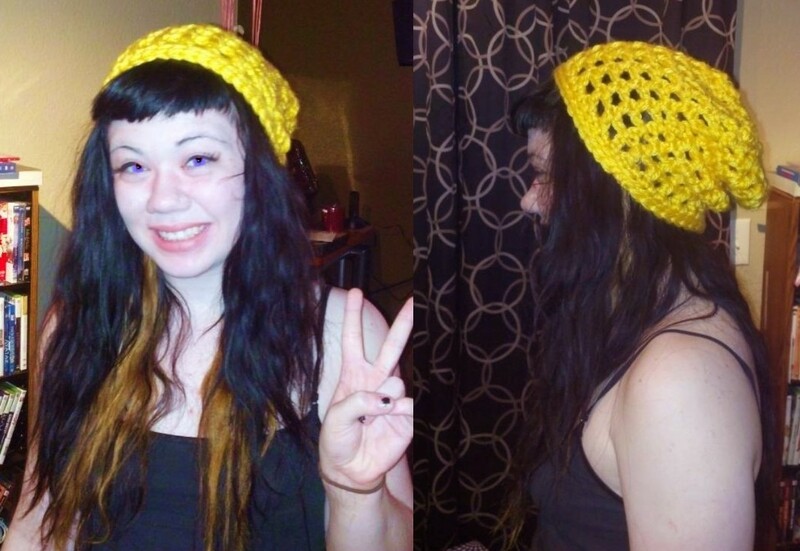 I couldn't blog about this before Christmas because it was a surprise, but she did send some pictures via text yesterday and I am told she loves her new slouchy hat!